One cannot completely quantify someone’s life into five simple quotes, and I am certainly not about to start that today on pastorsponderings either. General Eva Burrows was promoted to glory last week at the age of 85. We celebrate her life, and we recognize too the joyous celebration in heaven she is now receiving. She was, from all accounts, a godly woman. 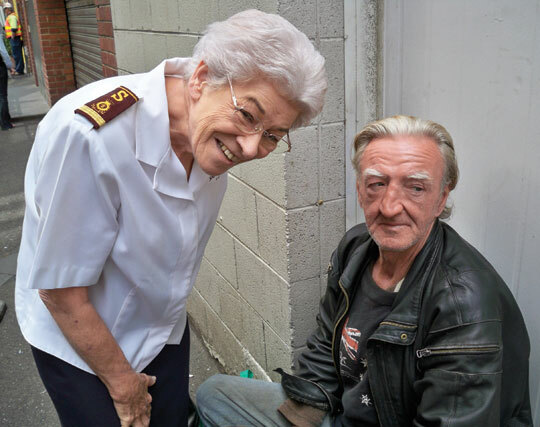 She was a well loved and respected General (the second female General) of The Salvation Army. She had a passion to serve the risen Christ, and she propelled the Army forward while leading as its General. I had the opportunity of meeting General Burrows as a child, and from what I recall she never forgot your name. People mattered to her. Her leadership spoke of helping the homeless and hurting, changing the dynamics of communities and better equipping our Army to make that happen. We were extremely fortunate to have General Burrows as our General and leader. Though it has been years since she retired from officership, her legacy is one to be admired and serves to push every soldier forward into the fray as we all strive to serve the risen King. 5 thought provoking quotes from General Burrows. General Burrows was the kind of leader that was a mover and a shaker in our army world. She was a servant and faithful soldier even after retirement. Her passion, leadership, and grace lives on in the lives that she touched. Our army is better because of her faithfulness to the Lord. Our army needs more Eva Burrows who are will to serve and lead. I am not putting General Burrows on a pedestal today, I am simply pointing to a person who wished to resemble the very Christ we all serve today. May we do likewise in every aspect of our lives…from the corps halls to schools, orphanages, clinics, divisional and territorial offices and beyond. May we strive to reflect Christ in all we do and say. General Eva Burrows, well done good and faithful servant! Previous Post Previous post:Dear Salvation Army, The Voice of Dissonance? Next Post Dear Salvation Army Soldier, Don’t Forget Your Children! !